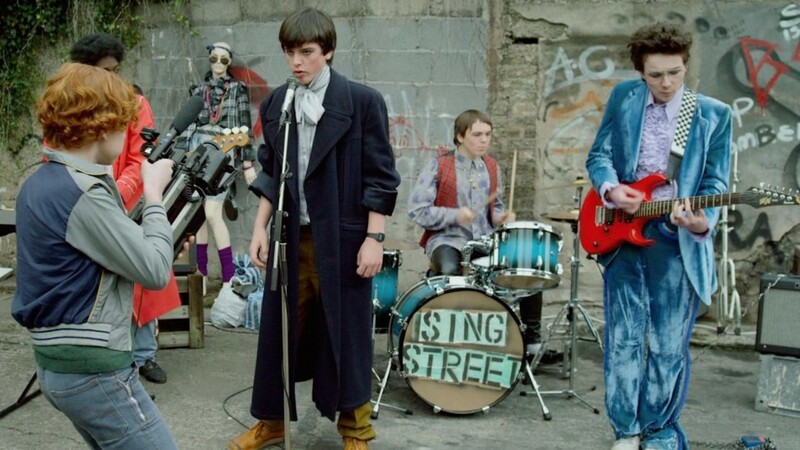 Sing Street charts the musical output of a group put together with a typically less-than-artistically-pure purpose in mind - to impress a girl. Inspiring teen viewers with its captivating representation of the pure joy, creativity and self-expression that comes from being part of a band, the film also offers audiences of an older generation a healthy dose of nostalgia. Writer/director John Carney, who also directed musicals Once and Begin Again, imbues the film with much of his own experience growing up in Dublin, but with the character of Conor he allows his creation to be more adventurous than he ever dared to be at that age. Set in Dublin in 1985, the film opens with 15-year-old Conor's family in upheaval as his parents tiptoe around the thorny issue of divorce - something that was not permitted in the strict Catholic society of the time. On top of this tense atmosphere, money is tight and savings need to be made. 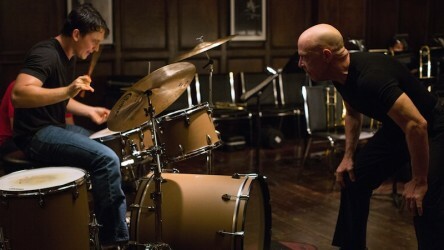 To cut costs, Conor is removed from his fee-paying school and sent to local state school Synge Street (a school that the writer/director John Carney really attended), and where he is initially a fish-out-of-water in the anarchic environment, presided over by the strict and unsavoury Brother Baxter. Unintentionally challenging authority from the outset, Conor is chastised for wearing non-uniform brown shoes instead of standard issue black, in an incident that later inspires a punky protest song. Conor continues to clash horns with Brother Baxter as his personal style evolves alongside the honing of his musical persona. The catalyst for Conor's transformation is the mysterious and beautiful Raphina, whom he spots near the school gates on his first day at Synge Street. To justify making an approach, he claims he's looking to cast her in his band's latest music video. However, at this point he doesn't even have a band! But with the help of enterprising new friend Darren, Conor recruits a motley crew of new schoolmates to form a group on the fly, naming their band Sing Street, in a play on the school's name. Despite having no clue what they're really doing, the group go in with the spirit of adventure, donning costumes that initially seem as though they've raided an older siblings dressing-up box to achieve a look inspired by the likes of Duran Duran and The New Romantics. Darren, as the band's self-styled manager, steps up as the cameraman to film a spur-of-the-moment music video in the backstreets of Dublin, complete with questionable zoom-ins and clunky set-pieces, all inspired by their weekly Tops of the Pops viewing. Similar examples off-the-cuff DIY-style filmmaking can be seen in the send-ups of classic films produced by Greg and Earl in Me and Earl and the Dying Girl, while the exuberance of collaborative filmmaking as a creative outlet during troubled times is also shown in Son of Rambow. It turns out that forming a band is the making of Conor - or Cosmo as he is rebranded - as his status as lead singer and creative director of the group takes off. Conor is someone who absorbs influences and has a keen tutor in Brendan, his slacker-philosopher older brother, who takes pleasure in trying to shape the direction he thinks Sing Street should go, despite not having a very clear idea of what to do with his own life. Helping to come up with a strategy for Conor to win Raphina's heart - as well as succeed as a band - allows the brothers to bond and support one another as the rest of their family life crumbles around them. With Sing Street, Conor and his friends push their self-expression, and experiment with a new image for every song, embracing the same defiantly rebellious status as the 13-year-old Swedish punk trio in another 80-set high-school film We Are The Best!, and the self-proclaimed overachieving outsiders who revere 90s culture with their pop-punk band in 2015's LA-set Dope. 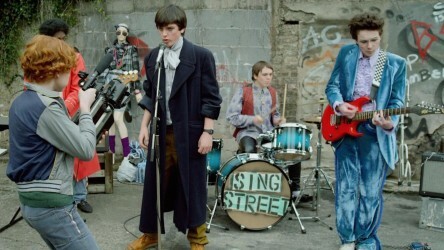 Sing Street covers most bases within the high-school comedy genre, but this only forms a backdrop to the pursuit of music, which creates a joyous, compelling energy as we see the initially jarring band start to find their harmony (in a similar fashion to the band in another Dublin-set music film, The Commitments). Alongside this, the relationship between Conor and Raphina deepens and become more complex with each video that they produce together. With the creative output of the band representing escapism for them both, as they pick up momentum, the dream of leaving their lives in Dublin behind starts to seem a more realistic prospect. In another homage to the teen genre, there is a set-piece devoted to the traditional American high-school prom, as seen in the likes of musicals Grease and West Side Story; comedy Napoleon Dynamite; and genuine 80s high-school drama Pretty in Pink. 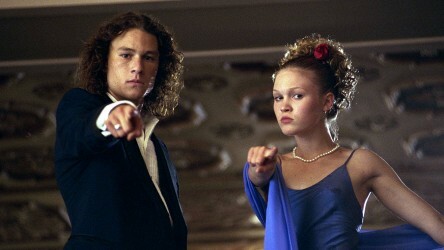 The high-school prom even features in Shakespeare adaptation Ten Things I Hate About You, while another example in 1985's Back to the Future even forms part of the characters' own cinema-going habits, and provides the visual concept for one of their music videos. Working as the dramatic payoff in most high-school films, the prom is an opportunity for Conor to take centre stage, and attempt to bring the situations he is dealing with to a head. Sing Street is a coming-of-age musical comedy that touches on difficult issues around family life and abuses of authority while managing to maintain a joyous and defiant mood. While there is strong nostalgia for the music and style, and playful affection for the Dublin setting, the film doesn't neglect to acknowledge that some of the more conservative and reactionary attitudes of the time are better left behind, and that creativity is the way forward. Explore Sing Street and other school-themed film titles with our Into Film Recommends podcast below, or login to SoundCloud to download the podcast and listen on the go. We cannot guarantee that all films discussed in this article are covered by the PVSL and are part of our catalogue, but where possible we aim to ensure that this is the case. A film guide that looks at Sing Street (2016), exploring its key topics and themes through informal discussion. A film guide that looks at 10 Things I Hate About You (1999), exploring its key topics and themes through informal discussion. 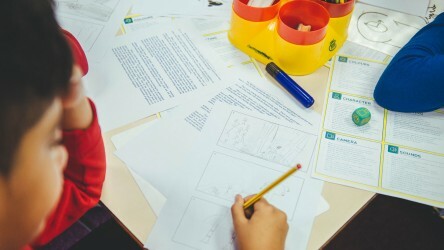 Chris Baldwin, Head of Collaborative Learning at William Allitt, discusses what he learnt from our free online course Teaching Literacy Through Film.